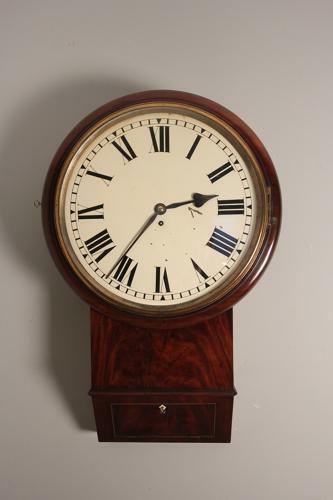 A mid 19th century oversized drop dial in Mahogany, having the most wonderful colour and grain throughout. The 16 inch dial with original paint work having a convex brass bezel retaining its original lacquer. The case made in solid Mahogany with chiselled bottom and large access door. Having an 8 day fusee movement of which is in excellent condition. Retaining all the original fittings including the key. English, Circa 1860. Dimensions: Height: 71 cm - 31 Inches, Width: 51cm - 20 Inches, Depth: 18 cm - 7 Inches.